Custom oil change stickers is a strong tool to advertise your oil and lube business name and reminds your clients when to come back. 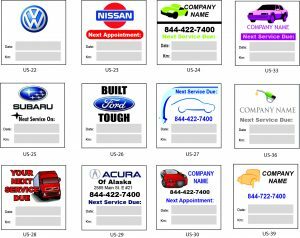 Oil change stickers can be printed with your corporate colors, corporate logo and your business name for strong impact. They are easily read through any windshield. 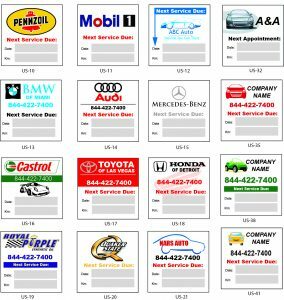 Oil Change stickers help your clients recollect when to service their vehicle. 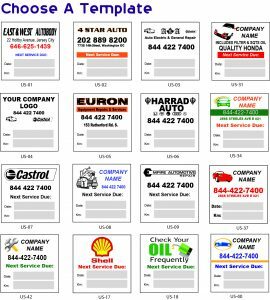 Oil change stickers are a superb apparatus for Auto Repair Shops, Auto Body Shops, Machine Repair Shops, Equipment Repair Shops etc. At ePrintOne we customize our oil change stickers so they are printed on a strong low tack clear vinyl which can be easily removed without leaving any buildup or residue on the windshield.